Disclosure: I saw Disney On Ice complimentary, but all thoughts and opinions are my own. Last night my family and I enjoyed one of our favorite holiday activities – seeing Disney On Ice together! Last night, we saw the Southern California tour debut of Disney On Ice: Dare to Dream, and I have to say it was my favorite Disney On Ice show I’ve seen to date! The show opened with the debut of the Coco pre-show, where Miguel played on his guitar “Remember Me” and “Un Poco Loco”. Coco is one of my daughter’s favorite movies, so this was a great way to get her pumped for the show! The first act featured the stories of Beauty and the Beast, Cinderella, and Tangled. The Tangled scene was absolutely remarkable, being one of the most impressive Disney On Ice scenes we’ve seen. The next act featured the story of Frozen, and then the Disney On Ice debut of Moana! The Moana parts were absolutely amazing, the light projections on the ice to make it look like the ocean were beautiful (I actually got goosebumps!). Our favorite part was “Shiny”, it was really neat how they did the effects and portrayed Tamatoa. 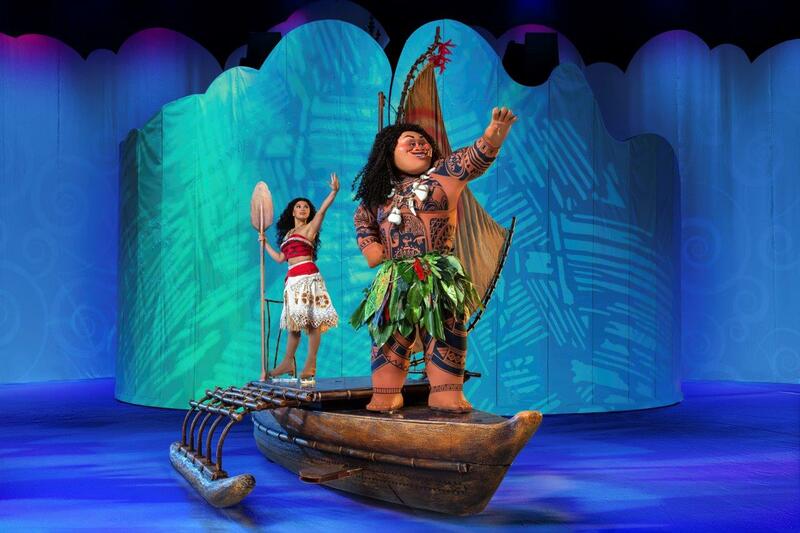 Moana is the perfect story to be told during Disney On Ice, and fit in nicely with the classic tales that were also part of the show. The stories flowed together nicely, all showcasing the theme “Dare to Dream” in a wonderful way. To celebrate Moana’s Disney On Ice debut we attended a Polynesian Islands pre-party, where we enjoyed watching Polynesian dancers, took hula lessons, and made kakamora crafts! My daughter dressed up as Pua for the occasion. And an extra special treat? We were also able to meet Mickey and Minnie Mouse by attending the VIP pre-party! It was a truly magical evening, and made for a memorable holiday family moment. You can learn more about the dates for Southern California here, and purchase tickets by visiting DisneyOnIce.com.